Nice I like the forward Momentum. 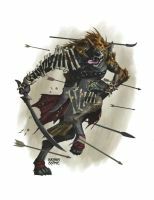 look so fantastic, but why gnolls and some other creatures are drawed with 3 toes? Nice rim light Looks stunning! Nice work. I'm a big fan of Frostgrave and your artwork really brings it to life. Some of them look more like Skaven/Ratkin than gnolls! Other than that, detail and scene are great! I WAS PLAYING D&D THIS MORNING!!!!! Run, the hyenas have developed better brains and can walk on two legs, run before its too late!, that's what I'd be thinking if I saw that in real life!